Some days it’s just hard to keep up with all the information forced into our heads through multiple media outlets with varying agendas. Who’s right, who’s wrong, who’s good, who’s bad – tell me, tell me, tell me. But what if a prominent political figure came out to LISTEN to YOU? To discuss the urgent issues of today without laying blame on any one person or any one party? What if they came here to discuss ideals, solutions and possibilities and offer hope instead of hate? 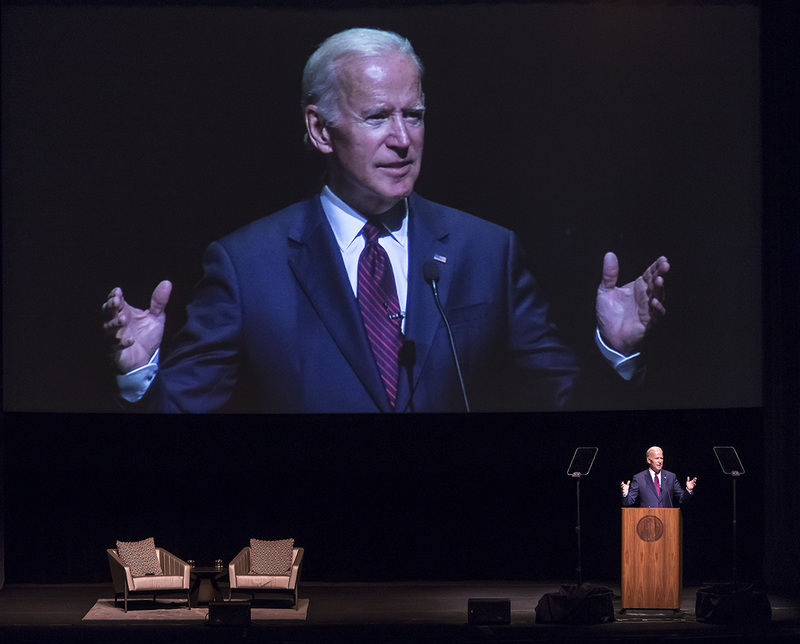 That is exactly what former Vice President Joe Biden offered when he stopped by The Arlington Theatre on October 21st as part of the UCSB’s 2017 Art & Lectures Series. This was a hot ticket, so much so that I had to watch the event via a free live stream at UCSB’s Campbell Hall with about 200 students as part of the overflow. 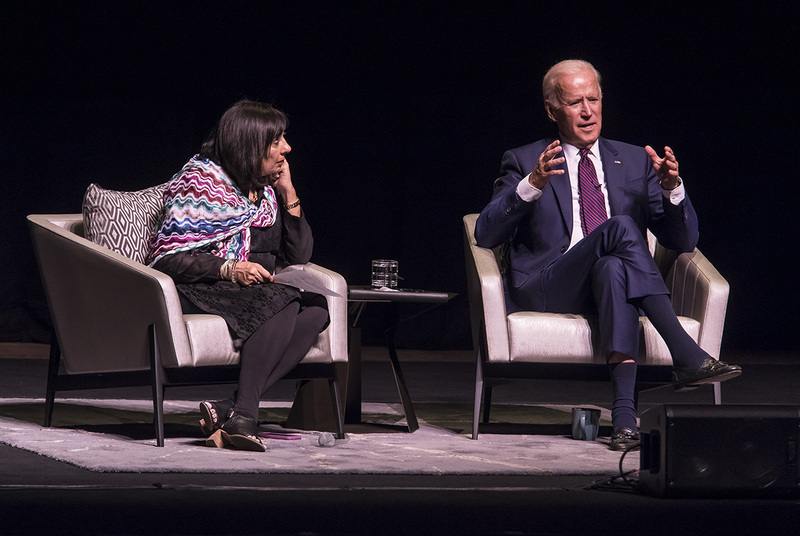 We were out of sight but not out of Joe’s mind, “I offered to come by the campus to speak to the students unable to attend (at the Arlington), but they told me ‘it’s too far to the campus’ – where are you?” Joe joked as he started into the lecture. 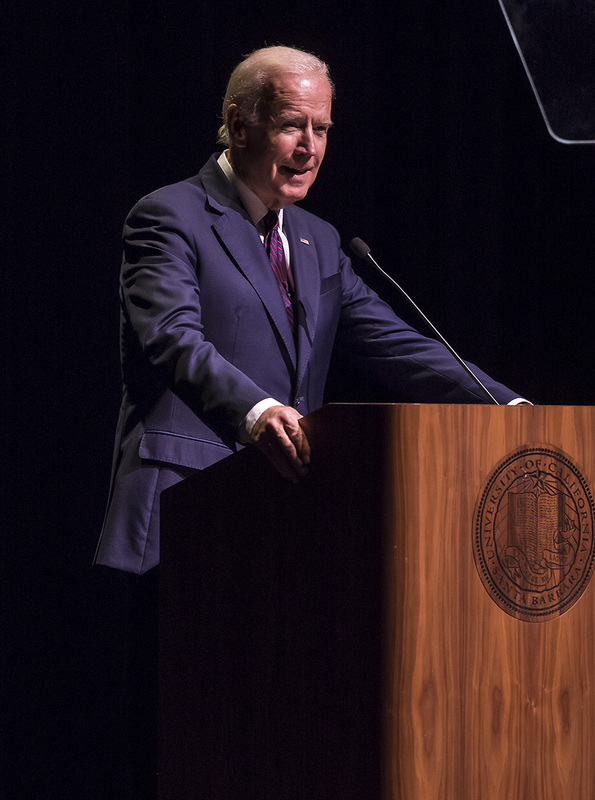 The number of students present for the lecture was a testament to UCSB and the series, and Joe was prepared to answer all questions and discuss all ideals. And he wasted no time. He did not jump in by talking poorly of current President Trump as you might expect a former Democratic VP to do, and he did not jump in by building up his time in the office as you might expect a former Democratic VP to do. Instead he offered ideals. The generation of these students are the most educated, the most tolerant, the most technically advanced. “But it doesn’t matter, if you don’t engage in the public square… You can make an impact in moments like this,” Joe proclaimed. A lot has changed over the last 50 years, and society is trying to adjust to these changes: digital age, global community, fall of empires. And we need to get the political system up to par. One: Americans need to talk to each other, try to understand where the other person is coming from. “It is alright to question someone’s judgement; however, you should not question their motive – because you don’t know.” All politics are personal, so you need to respect where those emotions are coming from. Two: The system needs to support the middle class. Throughout history, US has had an ascending middle class, until now. Now there is a sense of hopelessness resulting in increased drug use and suicides in white males ages 40-48. Three: Americans need to restore the soul of the nation, stop blaming our problems on the “other.” Respect and respond with respect. Stand up for the American Story! The ideals that America was based upon: there is possibility in the US. “Lead by the power of our example, not the example of our power,” Joe urged strongly. Be the example to the world. Joe offered many personal stories as testament of his experience throughout the lecture, adding a loving touch of humor and humanity to the seriousness of the ideals he presented. The Millennial generation faces a similar political divisiveness as the youth of the 60s; the youth of the 60’s had to do something then, as they do now. “There is not a damn thing we can’t do,” Joe encouraged, “it’s time to lead again. We are so well positioned. So America, GET UP.” It’s moments like this that make me proud to be an American. **Note: Right after the Q&A, the student’s at UCSB’s Campbell Hall got a message from A&L that Joe insisted on visiting them on campus after the reception commenced at The Arlington. So, the Hall went on lock down, preventing any tweets out and any sneaks in. 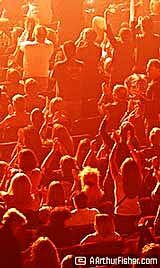 Although I snuck out because I am not a millennial and had dinner plans, I received confirmation that Joe did indeed make it all the way to the campus and talked with the students for well over an hour.